During 1966-67, the US Navy SEALs and other US SpecOps forces tried several designs in an attempt to increase the firepower of their grenade launching systems over the M-79. One of these systems was a triple-barreled grenade launcher designed to be carried under the M-16 and CAR-15. It never received any official denomination, thought some sources call it the XM-79. I cannot be sure about this. This design used a slide-forward loading design in a similar manner to the then-experimental underbarrel grenade launcher, the XM-148, but improved to prevent dirt from entering the mechanism and eliminating the guide bar system of the XM-148. The trigger mount is similar to that of the XM-148, however. The barrels are shorter than that of the XM-148 or M-79, being only 6 inches, to allow it to fit under the CAR-15 without projecting beyond the barrel. 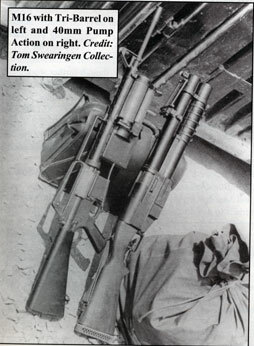 At least three and as many as five of these launchers were built; one was known to have been sent for combat testing to Marine Force Recon in Vietnam, while the rest were sent with the SEALs. The firepower was well thought of, but that was the only thing they liked about the design. The launcher was unwieldy, unbalanced the rifle it was mated to, and the complex firing mechanism did not stand up to the dirt and mud common in Vietnam. In fact, when the trigger was pulled, there was about a 50/50 chance that the round would not fire. The design remains an interesting, though flawed and failed, attempt to increase firepower.